HOUSTON - (Feb. 19, 2019) - A boost of vitamin C helped Rice University scientists turn small gold nanorods into fine gold nanowires. 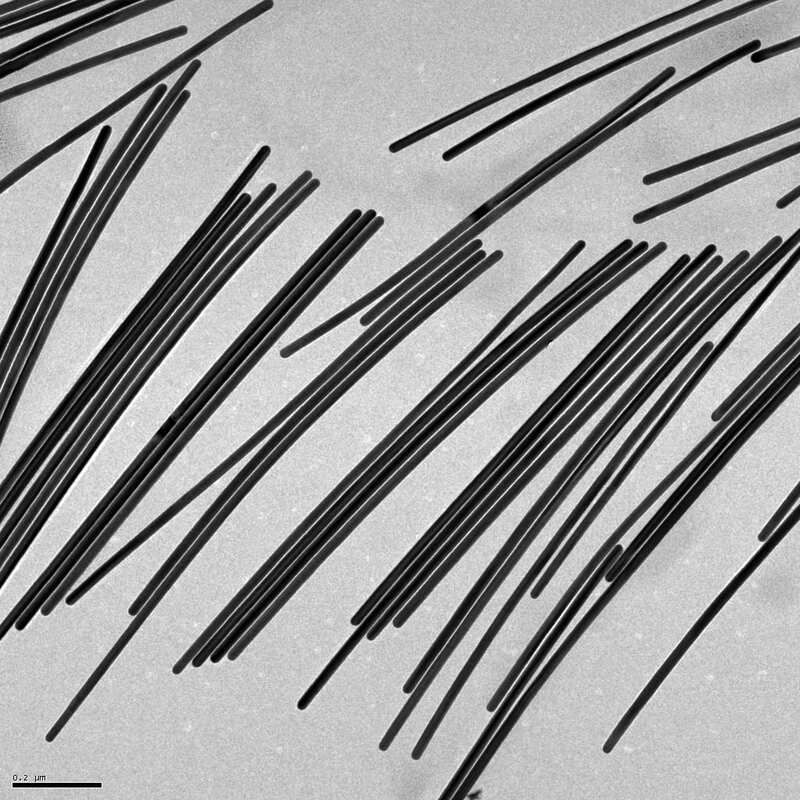 Common, mild ascorbic acid is the not-so-secret sauce that helped the Rice lab of chemist Eugene Zubarev grow pure batches of nanowires from stumpy nanorods without the drawbacks of previous techniques. "There's no novelty per se in using vitamin C to make gold nanostructures because there are many previous examples," Zubarev said. "But the slow and controlled reduction achieved by vitamin C is surprisingly suitable for this type of chemistry in producing extra-long nanowires." Details of the work appear in the American Chemical Society journal ACS Nano. The Rice lab's nanorods are about 25 nanometers thick at the start of the process - and remain that way while their length grows to become long nanowires. Above 1,000 nanometers in length, the objects are considered nanowires, and that matters. The wires' aspect ratio - length over width - dictates how they absorb and emit light and how they conduct electrons. Combined with gold's inherent metallic properties, that could enhance their value for sensing, diagnostic, imaging and therapeutic applications. Zubarev and lead author Bishnu Khanal, a Rice chemistry alumnus, succeeded in making their particles go far beyond the transition from nanorod to nanowire, theoretically to unlimited length. The researchers also showed the process is fully controllable and reversible. That makes it possible to produce nanowires of any desired length, and thus the desired configuration for electronic or light-manipulating applications, especially those that involve plasmons, the light-triggered oscillation of electrons on a metal's surface. The nanowires' plasmonic response can be tuned to emit light from visible to infrared and theoretically far beyond, depending on their aspect ratios. The process is slow, so it takes hours to grow a micron-long nanowire. "In this paper, we only reported structures up to 4 to 5 microns in length," Zubarev said. "But we're working to make much longer nanowires." 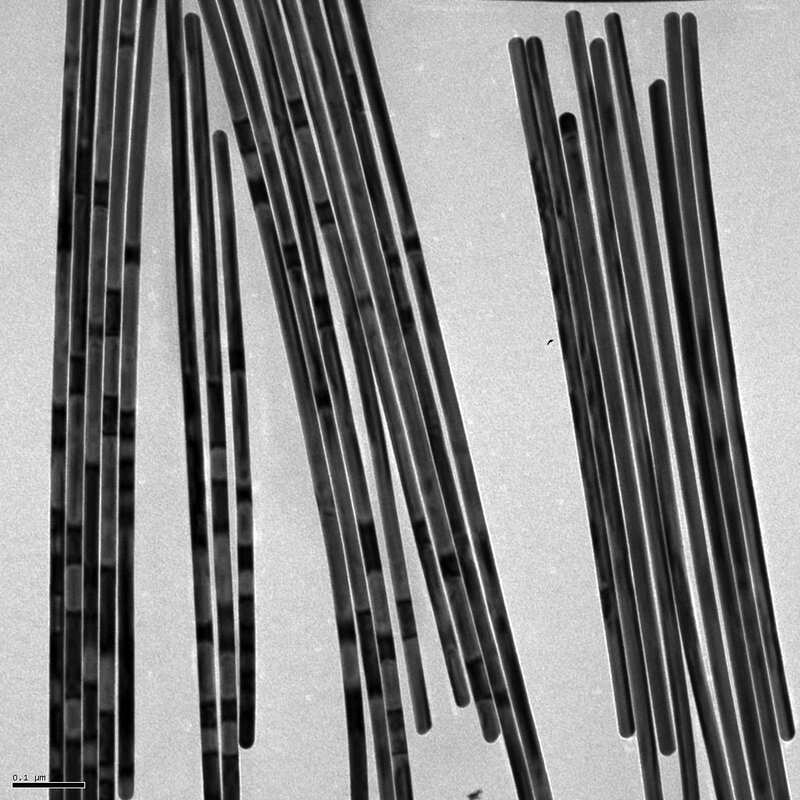 The growth process only appeared to work with pentahedrally twinned gold nanorods, which contain five linked crystals. These five-sided rods -- "Think of a pencil, but with five sides instead of six," Zubarev said -- are stable along the flat surfaces, but not at the tips. "The tips also have five faces, but they have a different arrangement of atoms," he said. "The energy of those atoms is slightly lower, and when new atoms are deposited there, they don't migrate anywhere else." That keeps the growing wires from gaining girth. Every added atom increases the wire's length, and thus the aspect ratio. The nanorods' reactive tips get help from a surfactant, CTAB, that covers the flat surfaces of nanorods. "The surfactant forms a very dense, tight bilayer on the sides, but it cannot cover the tips effectively," Zubarev said. That leaves the tips open to an oxidation or reduction reaction. The ascorbic acid provides electrons that combine with gold ions and settle at the tips in the form of gold atoms. And unlike carbon nanotubes in a solution that easily aggregate, the nanowires keep their distance from one another. "The most valuable feature is that it is truly one-dimensional elongation of nanorods to nanowires," Zubarev said. "It does not change the diameter, so in principal we can take small rods with an aspect ratio of maybe two or three and elongate them to 100 times the length." He said the process should apply to other metal nanorods, including silver. Read the abstract at https://pubs.acs.org/doi/10.1021/acsnano.8b09203.